There are so many movies about racism and civil rights that it’s almost shocking. It’s a category all on it’s own, because for such a horrific period in our history, everyone just seemed to be horrible people. For whatever reason. Each decade was and is a little different than the last, but as we grow as people, it’s important not to forget where we came from. That means remembering the bad parts as well. It’s one thing to read about in a history book or documentary, it’s another thing completely when you take an unfiltered look into the reality of the circumstances themselves. American History X is a film with an original story that really dives into our history in a bold way. 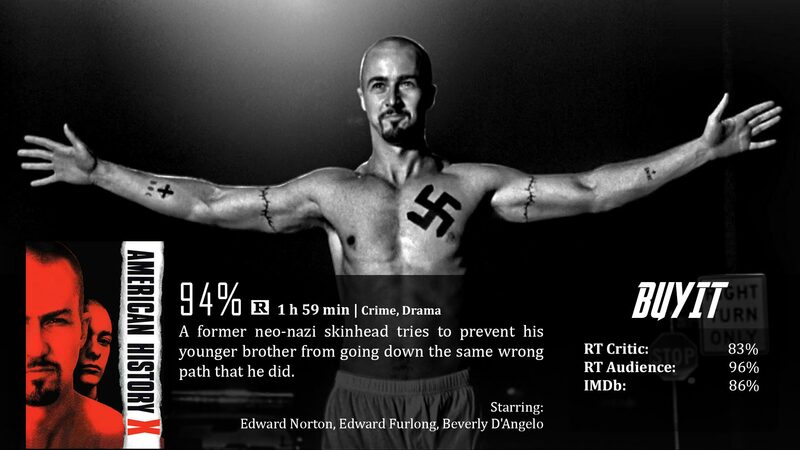 The “American History X” in question is actually a research paper given to Danny Vinyard (Edward Furlong) about his brother, Derek (Edward Norton) who was just released from prison for killing two black men trying to steal his car. Derek was a skinhead racist before going to prison, and whatever happened during the three years he was behind bars transformed him into, well, a reasonable young man who only cares about looking after Danny, and stopping him from becoming a monster like he once was. Danny has until the next day to learn from his brother and finish American History X…and as we have learned – a lot can happen in just one day. That actually surprised me. I’ve seen this movie probably twice before, and it never occurred to me that the movie in all actuality takes place in only a single day. It just seems like more because it is littered with flashbacks all over the place, explaining Derek’s entire life story (pretty much). I always thought it was a nice contrast between the color and the black and white shots. There is so many different ways you can interpret the decision to go that route. Were the black and white scenes just because they took place in the past, or is it on a deeper level? Before he was incarcarated, Derek saw the world of blacks and whites in black and white. Then after his rebirth, so to speak, he saw things more clearly…in color. Anyways, this is one of the most incredible films in American history….x. I’ve never seen a movie take such an honest look at the inhumanity of racism. I mean, this does such a great job at showing how contagious hatred can be, and how impressionable young people are in our world, especially when we’re stupid around them. But beyond that, it doesn’t fear getting its hands dirty by making this one of the most vile and violent films around. With my background in Criminal Justice, I know the preferred goal of incarceration is rehabilitation, and I know how incredibly rare that actually is. His transformation, and what he went through to get to that point is brave and believable. Oh yeah, how did I forget about the acting? Edward Norton is one of my favorite actors in terms of drama. The man has serious, serious skills. I know in real life he’s apparently a pain in the neck, but he has real talent, and I believe this is one of his best, if not very best performance. The talent doesn’t end there. The entire cast, if you haven’t seen this movie, will blow you away. Edward Furlong in his other great role included. Before I finish this review, I also want to nod to an impressive musical score , a beautiful eye for photography, and an incredibly intelligent talent in editing together an out-of-order story brilliantly. Great work all around! This is definitely a great movie. As far as taking an in-depth look at racism and the contagious effects of hatred and ignorance, this film takes the cake. Not only that, but just the way it was made on a technical level is pure brilliance. That shouldn’t be ignored. This isn’t for everyone. It is out of order, just to keep the audience guessing – but not everyone will really be able to follow the jumps in time. Also, whenever I run into movies with excessive language. 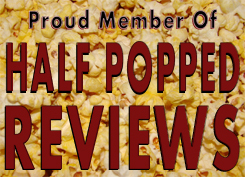 You know – every other word is an F bomb type of deal, I feel the need to mention it here, because not everyone is willing to watch a movie like that. Bob Sweeney: Has anything you’ve done made your life better? Fun to see you review it and like it as much as you did. And that I say because this is one of my favorite movies of all time. I saw this in Film Appreciation class and the brutality of some of the scenes still bother me to this day. By now, I’ve seen worse, but hey! I was in college. Anyways, its still an incredible movie. Great review! Great review! I love the way this movie tackles racism. Plus it has the most brutal curb stomp in cinema!